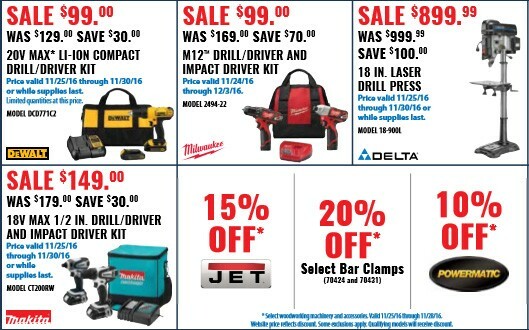 We got a leaked copy of the ACME Tools Black Friday and Cyber Monday ad scan and the deals do not disappoint. In addition to brand deals like 15% off Jet tools and 10% off Powermatic tools, they also have some specific deals on popular cordless combo kits from the major brands. One of the best deals, though, is the 15% mark down on DeWalt TSTAK and ToughSystem cases. I am a huge fan of the ToughSystem and this is a great time to expand. Another sweet deal is $50 off Honda generator 3,000W and below and $200 7,000W. Also note that some of the deals run past Cyber Monday and into December. 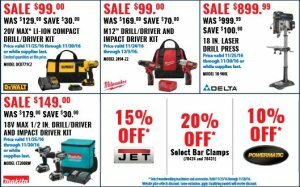 To see all of the ACME Tools Black Friday and Cyber Monday Deals, check out the Ad scan below.